In 1848 Plum Island was the original location of the Port des Morts light before it was relocated to Pilot Island in 1858. The island remained undesignated until 1895, when the US Congress, at the recommendation of the Life Saving Service, appropriated funds to build a station on the northeast side of the island. Ferry passengers and visitors to Northport often mistake the white tower on Plum Island for a lighthouse, but is actually the rear range light of the Plum Island Range Lights. In 1890, the Light House Board recommended that range lights and a fog signal be built on the southwesterly portion of Plum Island at a cost of $21,000. Congress approved the Board’s recommendation in 1893 but made no appropriation until 1895. 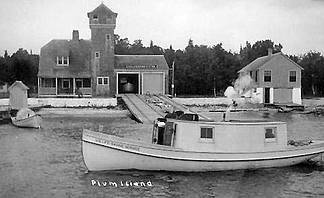 Not until august, 1896 did a crew of thirty men land on Plum Island to begin development of the station that stretched for over half a mile along the south and west sides of the island, making it easily the largest station in Door County. The men set to work clearing about 1 1/2 acres of dense forest for a camp and range sites as well as a strip 200 feet wide and 1600 feet long for the proposed range. They also cleared a site for the fog signal and a connecting roadway. The crew built a barn, boathouse, and several piers. At the same time, they built the concrete foundation for the rear range light and began building the two story brick keeper’s dwelling. During September, construction of the front range light took place and another three acres of land was cleared. During October, the ironwork of the rear range light was erected and the dwelling and the boilers were installed. During November, the men graded the area around the dwelling, and built over 2500 feet of wood walks which ran all the way from the front range light to the fog signal building. On December 4, 1896, about four months after the crew landed at the site, all the work at the station was complete except for installing the lighting apparatus. The men left Plum Island. The new station stood vacant until March, 1897, when Martin Knudsen, the Pilot Island keeper who had achieved national fame for his dramatic rescues there, officially became the first keeper of the Plum Island Range Lights. On May 1, 1897, keeper Knudsen exhibited the range lights for the first time. The front light was a sixth order fixed red light that shown through a single window in the front of a small, white, two-story wooden tower. 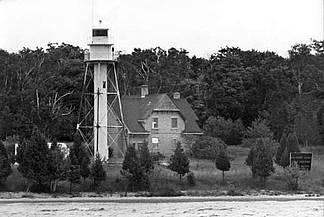 The tower had a square base and octagonal second story like the front range light at Baileys Harbor. The focal plane of the light was 32 feet abbot lake level, and the light was designed to be visible for 8 1/2 miles in clear weather through a small arc on either side of the range line. Up the range 1650 feet to the north stood the rear range light, a white, square, pyramidal, iron skeleton structure surmounted by an eight foot diameter, cylindrical watch room and octagonal lantern. a cylinder containing a spiral staircase in the center of the tower gave access to the watch room and lantern. The tower was 65 feet tall from the base to the top the ventilator ball, giving the light a focal plane of about 80 feet above lake level. The lantern contained a fourth order Fresnel lens which displayed a fixed red light visible in clear weather about 13 miles. The light was visible through an arc of 231 degrees so it could be seen in the Deaths Door Passage as well as down the range to the south. The keeper’s dwelling was one hundred feet southeast of the tower. A quarter mile to the north was the one-story, re brick fog signal building containing a steam fog siren. In front of the dwelling were several piers, boatways, and boathouses, as well as a tramways that led up toward the dwelling. 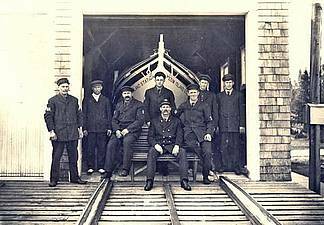 In 1915, the US Coast Guard absorbed the US Life Saving Service, and in 1939, the Lighthouse Service was merged into the US Coast Guard which took over the operation of the range lights. The piers and boathouse were removed and personnel were shifted to the old Life Saving Station across the island. In 1964, the original wooden front range light tower was replaced with a steel skeletal tower. Five years later, the range lights were automated. In 1975, the fog signal was discontinued and the forces of nature began the gradual process of reclaiming the station. Today the plum Island Range Lights still help guide sailors through Deaths Door, but only memories remain of the dedicated keepers who once made sure the lights were burning brightly.